For the past two years, Barack Obama has made it hard for anyone to pin him down philosophically. So when he raises his hand on Tuesday, exactly what -- beyond the efforts of an eager, data-driven problem-solver -- can the American people expect? Obama has spent his adult life tilting left while courting conservatives. That's how he won his very first campaign, for president of the Harvard Law Review. He has been known to call himself a "progressive," and when he occasionally uses the word "ideological" in reference to his own leanings, he clearly casts himself as somewhere left of center. There are at least three keys to understanding Obama's approach to (and avoidance of) ideology. There is, first, his simple joy in testing himself against those who disagree with him. Someone who knows the president-elect well says that he likes talking with philosophical adversaries more than with allies. But Obama's anti-ideological turn is also a functional one for a progressive, at least for now. Since Ronald Reagan, ideology has been the terrain of the right. Many of the programs that conservatives have pushed have been based more on faith in their worldview than on empirical tests. How else could conservatives claim that cutting taxes would actually increase government revenue, or that trickle-down economic approaches were working when the evidence of middle-class incomes said otherwise? Thus the second key: Right now, being empirical is in the progressive interest. Note that data show that the parts of the stimulus package most congenial to liberals (increases in unemployment insurance and food stamps; fiscal aid to the states; government spending on public projects) are also the parts with the most economic bang. In other words, progressives don't need ideology to make their case. In this respect, at least, Obama is rather like Franklin D. Roosevelt, who dismissed the conservative economic doctrines of the 1920s. "We must lay hold of the fact that economic laws are not made by nature," Roosevelt said, directly countering the central premises of orthodox economics. "They are made by human beings." Thus did Roosevelt make pragmatism and experimentation enemies of conservative ideology. Obama, wearing a smile as he stands on a mountain of data, is doing the same. But in a third respect, Obama's anti-ideological talk is not just a vehicle for progressive inclinations but the real deal. Obama regularly offers three telltale notions that will define his presidency -- if events allow him to define it himself: "sacrifice," "grand bargain" and "sustainability." That's where sacrifice kicks in. There will be signs of it in Obama's first budget, in his efforts to contain health-care costs and, down the road, in his call for entitlement reform and limits on carbon emissions. His camp is selling the idea that if he wants authority for new initiatives and new spending, Obama will have to prove his willingness to cut some programs and reform others. The "grand bargain" they are talking about is a mix and match of boldness and prudence. It involves expansive government where necessary, balanced by tough management, unpopular cuts -- and, yes, eventually some tax increases. Everyone, they say, will have to give up something. Only such a balance, they argue, will win broad support for what Obama wants to do, and thus make his reforms "sustainable," the other magic word -- meaning that even Republicans, when they eventually get back to power, will choose not to reverse them. It is riotously ambitious. But it's worth remembering that in November, Americans elected a man who counts "audacity" as one of his favorite words. 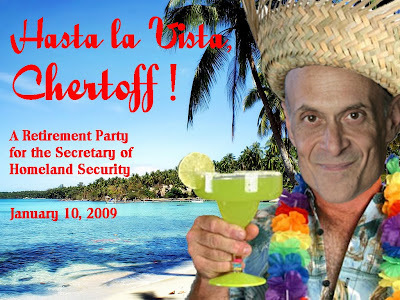 Let's all say goodbye to Sr. Michael "you-know-you-want-this" Chertoff - his tour of public service is over. FINALLY! As legislative sessions kick in, it's back to basics. Isn’t greater security important? Doesn’t a set of national standards set a minimum bar for security, bringing nationwide compliance up to at least a tolerable level? Aren’t standards — especially for something as important as security — good things? effectiveness: As Governor Schweitzer points out in the above-linked interview, most of the identified 9/11 hijackers would have qualified to be issued an ID under the requirements of the REAL ID Act. privacy: Among other issues of privacy, this Act aims to create a national database, available to many federal and state agencies, tracking personally identifying information about carriers of REAL ID compliant identification cards — which could also contribute to increased risk of identity fraud. risks: Some of the requirements of the Act may actually increase security risks, rather than reducing them. This is a common problem with broadly applied standards enacted by people (like Congress) who have no security expertise. Among the problems is the mandate for RFID chips in your wallet — a source of security vulnerability about which I’ve already written, in What to do about RFID chips in your wallet. Three months after the policy took effect, critics are pointing to a growing list of cases involving legal immigrants who have been significantly delayed or outright rejected in efforts to get or renew licenses despite being authorized to live and work legally in the U.S. Under the policy change, only applicants who have documents showing they have permission to stay in the U.S. for at least six months are eligible for Texas drivers' licenses. But immigration attorneys are reporting that people who meet that criteria but are unable to produce documents required by the Department of Public Safety to prove their legal status are still being turned away.